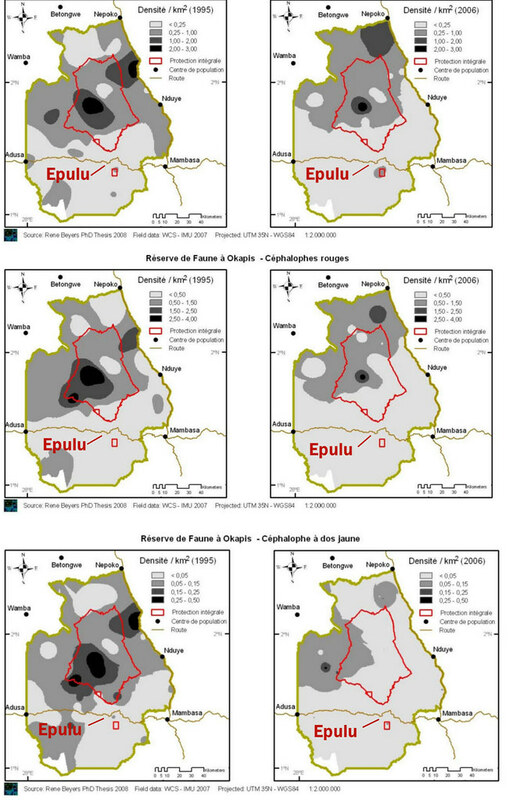 Searching for Bonobo in Congo » Bushmeat 10: Did the Bridge Collapse Create a Bushmeat Boom for Mbuti Pygmies? 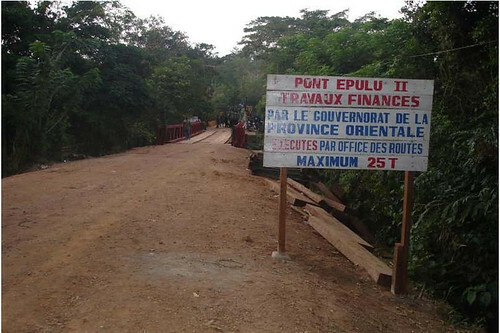 « Who’s Illegal Load Busted Congo’s Bridge? On 24 November, 2009, a Kenya-bound truck with two trailers carrying illegal wood from the Ituri Forest broke through the one lane bridge crossing the east branch of the Epulu River, at the Okapi Reserve headquarters. Vehicle traffic was forced to halt. Stalled vehicles and passengers in transit accumulated along the road and camped in the village of Epulu. In the days that followed, local dugouts were put into service to ferry travelers across the river. A couple weeks later larger rafts started to transport small vehicles. But big trucks with loads of passengers and merchandise adopted a new rhythm that included a long layover at the very center of the Okapi Reserve. 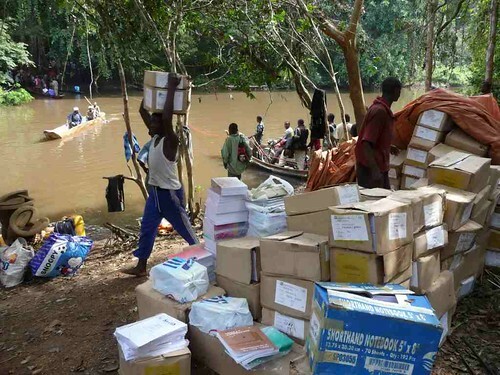 Transporting merchandise, carton by carton, from a truck on the east of the Epulu River to a truck on the west side. Photo by Conrad Aveling. That problem has been resolved in record time. The governor of Orientale Province and the Roads Department acted with unprecedented speed. Today (20 December 2009) the ribbon was cut on a new bridge. A tremendous crisis was lessened –not resolved – but lessened. The bridge collapse created a disastrous gash in the Reserve’s defenses and a boom in the bushmeat trade. Now with the new bridge in place bushmeat still bleeds from the Reserve as from a wound that refuses to heal. The new bridge is opened on the 20th of December 2009. Photo from the head warden, C.C. Mapilanga. Bushmeat hunting is part of the traditional way of life for Ituri’s mbuti pygmies. The Reserve was created in part to protect this tradition. Nevertheless, there has been a slow commercialization of hunting that was greatly accelerated by the recent war when domestic meat production dried up and conflict sent many refugees up against the forest. In the Ituri bushmeat was traditionally for the mbuti pygmies and local villagers, but it became a commercial trade item for export to surrounding markets. There were no regulations in place that could control this. Pygmy hunting was self regulated when we (John and Terese Hart) were doing our PhD research in the Ituri in the 1980s. At that time we could not convince mbuti to stay in the distant forest for more than very short periods because of “hunger” despite the fact that animals were more abundant farther from the village. Although mbuti will live in hunting camps for weeks at a time, their diet is always supplemented by rice and manioc from villagers’ gardens. In the 1980s mbuti women carried out bushmeat in the morning and brought back the basic starch staples in the evening. If the camp was too far in the forest, it required a longer walk with a heavy load, an overnight in the village and a long walk back to camp with an even heavier load the next day. This put hunger strains on the camp, and complicated the mbutis’ mutual help systems which work most smoothly when the work load is lighter. 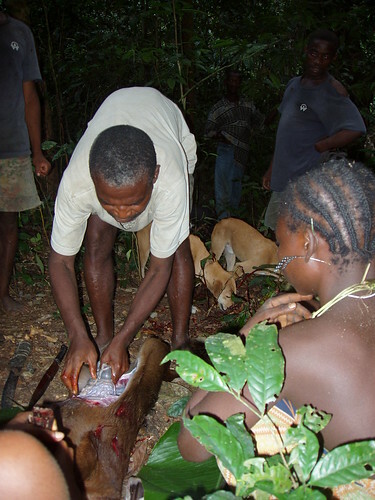 A red duiker being butchered on an mbuti net-hunt in the Ituri Forest, north of Epulu village. Photo by Kim Gjerstad. This self-regulated system changed with commercialization. 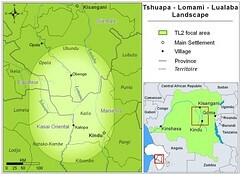 Now mbuti hunting camps are farther and farther in the forest. Village meat merchants carry out the staple foods, along with alcohol and small trinkets. They “buy” at minimal cost to sell at maximum profit. The result: mbuti continue to live from day to day although capturing more animals in more remote forest. The impact of the growing hunting pressure, even before the bridge collapse, was evident in the results of wildlife surveys conducted in 1995 and 2006. Both surveys used identical methods and sampled the same sites. The results show major declines in population indices for all the species of hunted duikers (antelope). Declines ranged from 26 percent for the common blue duiker, the most common and frequently killed species, to 42 percent for the rarer, but highly prized red duikers (4 species) and 59 percent for the even larger yellow-backed duiker. Populations of all species declined overall, but the decline in the most remote uninhabited central reserve is highly disturbing. This can only be attributed to an increase in hunting pressure in these remote areas. Suddenly a new big market of stranded travelers on Route-Ituri sprang up right at the end of the foot paths out of the forest. Not only did they eat bushmeat but they bought enough to carry on to their destination. Now the brief boom market is gone, but commercial bushmeat traders will continue to follow mbuti hunters into the forest, they will continue to carry out loads of bushmeat, and that bushmeat will continue to feed an ever-growing market. The warden of the reserve calls for more help to return the Reserve to its original intent: an area where traditional hunting is allowed but no commercial hunting is permitted and where there is no hunting at all in a large central part of the reserve (“protection integrale” on the maps above). The warden suggests a provincial decree to establish a no-hunting season in the Reserve. He asks for collaboration of the national security services to enforce the decree. We ask the governor, whose rapid action to repair the bridge has solved an immediate crisis, to now help solve the chronic underlying lesion. If government authorities put the law and law enforcement facilities in the service of conservation, there would be radical improvement. In the 1970s: Bushmeat Trade Manipulates Pygmy Economy and the Fate of the Forest. This entry was written by Terese Hart, posted on 2009-12-21 at 3:06 am, filed under Bushmeat, Indigenous peoples. Bookmark the permalink. Follow any comments here with the RSS feed for this post. Post a comment or leave a trackback: Trackback URL.